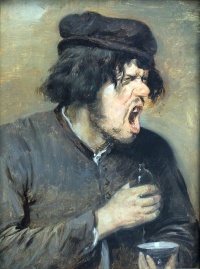 Bitter, one of the five basic tastes. Bitterness, an emotion similar to resentment. It is also used to express value judgments in the cultural arena: "Goya's bitter series of aquatinted etchings were published in 1799 under the title Caprichos." Unless indicated otherwise, the text in this article is either based on Wikipedia article "Bitter" or another language Wikipedia page thereof used under the terms of the GNU Free Documentation License; or on original research by Jahsonic and friends. See Art and Popular Culture's copyright notice. This page was last modified 12:10, 19 October 2013.